Immobility is a very common symptom of getting older. While some people may continue walking well into their 70s, 80s, or even 90s, others require the use of a wheelchair to reclaim their independence and get where they need to go. The latter group can find comfort in the fact that wheelchair ramps are available for home installation, and they can make getting in and out of the house much easier. If you’re beginning to age in place inside the home where you feel most comfortable, consider purchasing the following ramps to ensure your home maintains itself as a place of comfort and accessibility. 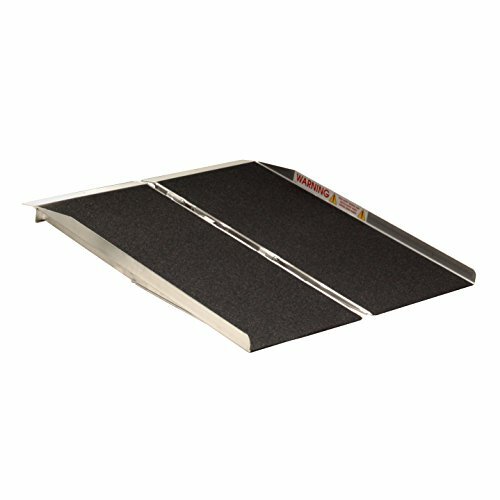 Many of these ramps can also be used on the go or for your car, so you can maintain your independence wherever you go. What is a Wheelchair Ramp and Why Use One? This van ramp is easy to use and install, which takes the hassle out of the daily wheelchair to vehicle use. It is highly reliable and made from sturdy materials, sure to last you a long time. Not all wheelchair ramps lead up to houses or buildings; some, like the Prairie View Rear Door Ramp, are made specifically for vehicles. This wheelchair ramp is made of aluminum, making it lightweight and easy to handle, but also very durable. The surface of this ramp is covered with anti-slip, high traction safety tape, ensuring that wheelchairs won’t slide around when in use. Ideal for wheelchairs or scooters, this ramp can hold up to 800 pounds of weight. It is easy to install, which is great for caregivers or family members. After it’s been used, you can fold it up into three sections and store it right inside your van. Uneven surfaces and small steps through thresholds can be a hardship for wheelchair users, but this ramp lets you conquer those with ease. Just as van ramps are an alternative to your average building wheelchair ramps, the Prairie View Threshold Ramp is designed specifically for doorways. 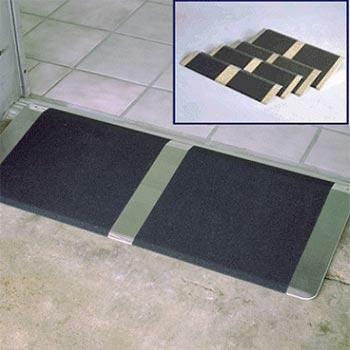 Made specially for easy installation, this ramp comes ready to place over small doorway bumps and rises that are difficult for wheelchairs to get over. A small bump along the way can deter wheelchair users, but the threshold ramp eliminates that problem. This threshold ramp is also affordable enough to use along all of the thresholds throughout your house, so you can get from room to room without having to worry. The anti-slip surface ensures that users are safe and secure while traveling over their thresholds. It is extremely lightweight, made from aluminum that is proven to last long. You never know whether a facility will have wheelchair accommodations or not, which is why this transportable, multi-fold ramp is a great solution for those on the go. Multi-fold ramps are great because of their convenience for both seniors and caregivers. The Prairie View Multi-Fold Ramp is uniquely designed to make it easier for you to use, carry, and store wherever you go. The ramp disassembles into two pieces and additionally folds in half to be carried like a suitcase. This design makes it incredibly easy to have wheelchair access almost anywhere you go. It is very lightweight, making it even easier to carry around. If you love to travel, this is a great option for seniors who love to be on the move. You will probably need your caregiver or someone to assist with carrying the ramp and setting it up, but it isn’t difficult to get into place. Like other sedentary ramps, this multi-fold ramp features an anti-slip surface that offers high traction, ensuring wheelchairs don’t slide around. Additionally, the welded construction of this product makes it highly durable and good for long-term use. Like its multi-fold counterpart, this ramp is convenient, easy to use, and easy to fold up to take along the way. With just a single fold, there is less hassle. The EZ-Access Suitcase Advantage Series single-fold ramp is designed for convenience and ease of use. Bridging the gap over steps, curbs, and doorways, this portable ramp folds in half to carry like a suitcase.. Like a multi-fold ramp, this one is easy to manage and take a long with you wherever you ago. Since it’s single-fold, it can be even easier to set up, especially if you’re a senior who is travelling alone, or you need to install it inside your house without instance. Simple setup lets you position the ramp where necessary. Safety features like the non-skid surface give you and your loved ones confidence. With a weight capacity of 800 pounds, this ramp offers excellent support for any scooter or wheelchair. Semi-permanent ramps are convenient because you can choose to leave them in one spot or utilize their portability. This solid ramp is sturdy, strong and gives you the best of both worlds. If you are looking for a more permanent fixture with a sturdy design, the Prairie View Solid Ramp might be the one you need. Its one-piece construction is excellent for wheelchairs and scooters alike. Made from aluminum, you can be sure that your solid ramp will remain durable for years to come. The surface is made from a slip-resistant material, ensuring that you or your loved one won’t slide around during use. While this ramp is certainly made to be more permanent, it is still easily moveable. The raised edges ensure that you or your loved one will not accidentally slide off, and optional widths let you customize to your needs. You may want to choose this option if there’s an area in your home that receives a lot of traffic, but isn’t easily maneuverable with a wheelchair. This ramp is also affordable enough to purchase multiples and place in other areas around your home. Aluminum is one of the best materials to look for when buying a ramp. This entirely aluminum ramp will last long and won’t get destroyed by inclement weather. As we have seen in other models, aluminum is an excellent material to use if you want a sturdy, long-lasting product. The HomCom Folding Wheelchair Threshold Ramp is constructed entirely of aluminum, ensuring that it does its job and lasts long. Made to be versatile, the HomCom ramp can be used with wheelchairs, scooters, and other things like bikes and motorcycles. 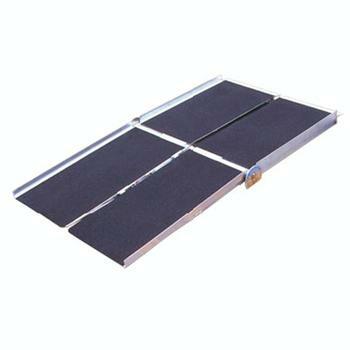 With its sturdy, anti-corrosive aluminum makeup, you can safely use this ramp outdoors and feel confident that you or your loved one will get the assistance they need. In addition, the ramp is covered with a skid-proof surface to prevent any sliding, even in wet weather. The raised sides prevent accidental falling. This makes it the perfect ramp for use outdoors, whether your loved ones needs help reaching their front door with a wheelchair or needs better access to an outdoor patio or deck. 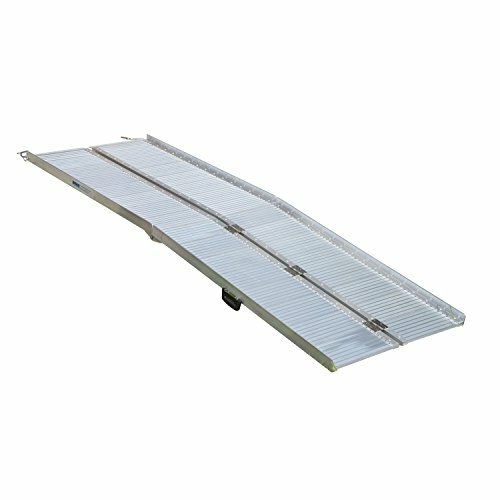 Despite its excellent strength and endurance, this ramp is lightweight and easy to transport and store. It folds down the middle, making setup and takedown a breeze for caregivers. Lightweight and foldable, we love this portable ramp and its simple operation. Many folding ramps make an on-the-go lifestyle easier. However, this one takes the cake. The Prairie View Portable Singlefold Ramp is made from lightweight aluminum, making it easy to lift, carry, and transport as you go along. While the aluminum design is light, it is also sturdy and reliable. This ramp folds down the middle, making it half its original size. It carries like a suitcase once folded, so there’s no awkwardness to it. Since you never know what kind of wheelchair provisions will be at any given location, a portable, easy-to-use ramp is highly convenient and helpful. The wide width is meant to fit most scooters or wheelchairs, while the anti-slip traction tape ensures your device will ride up and down smoothly without slipping—even when it’s wet outside. Know that it doesn’t have to be hard; there are solutions for you out there, including the use of a wheelchair ramp! A wheelchair ramp is just what it sounds like. It is an inclined plane that can be added to a home or facility to replace or add to stairs. This inclined surface is designed mainly to aid those who use wheelchairs, but it can also help seniors who find walking up or down stairs difficult. In addition, these ramps can be helpful to people pushing carts or strollers, along with other wheeled objects like rollators. When we think of a wheelchair ramp, most of us probably picture a long concrete ramp leading up to the entrance of a public building. Many times, there will be a set of stairs on the opposite side of the ramp. Because of the Americans with Disabilities Act, wheelchair ramps are required for most public-use buildings. This is certainly an accurate picture, however, there are many other kinds of wheelchair ramps that serve various purposes. Especially if you are a senior that is seeking to age in place, proper wheelchair ramps throughout your home will ensure that you can maintain your mobility, dignity and safety. Permanent and semi-permanent ramps for homes are usually made from concrete, wood, and even aluminum. Another kind of wheelchair ramp is referred to as portable. Many of these ramps are made from aluminum because it is lightweight yet strong. Portable ramps are great for those who are on the go, have a small porch step, or need to get through thresholds and uneven surfaces on a daily basis. 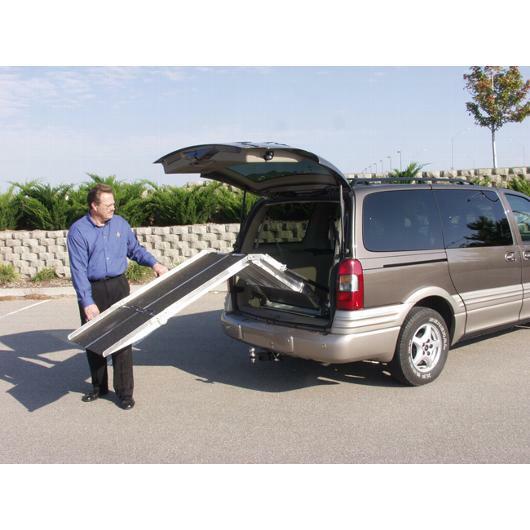 Most portable ramps fold up, making them small and easier to carry and transport. They are only recommended to be used when necessary, though most are durable enough to be left in one spot for a short period of time. If you’re aging in place and seeking to upfit your home for a long length of time, we recommend choosing permanent options that you can install and don’t have to worry about updating. Portable ramps are good as a temporary solution, rather than a permanent one. If you are considering purchasing a wheelchair ramp of any kind, whether for yourself or someone to whom you care for, you should think through a few factors. First of all, would it make more sense for you to invest in a permanent ramp, or should you stick with a portable option? A permanent ramp is ideal for someone who uses a wheelchair 24/7 and wants to stay in their own home. It wouldn’t make much sense to constantly pick up and put down a portable ramp, so a permanent fixture would be wiser, safer, and more cost effective. Portable ramps may be a good solution for someone who is temporarily in a wheelchair, say for an illness or injury. It is also a good idea for someone who is still capable of walking but may not feel comfortable taking on the stairs. A gradual climb up could be easier for them. Portable options are also great for seniors who travel a lot or still like to go out often to do things like get groceries, visit friends, or other daily activities. Portable options are foldable and easy to carry, although they still might require a caregiver to help bring around and set up when needed. Since many wheelchair ramps are utilized outdoors, it’s always smart to consider how weatherproof your purchase is. Something that is sturdy and water-resistant will do the trick. Anti-corrosive aluminum is an excellent and commonly used option. If you use a wheelchair, whether it’s on a part-time or full-time basis, you know how difficult it can be to maneuver the paths of your everyday life. We’re here to help you understand that it doesn’t have to be hard; there are many solutions out there, including the use of a wheelchair ramp.